Screenwriter and showrunner Carlton Cuse on shaping TV stories, collaborating with a team, the writers’ room and the importance of a good lunch. For top TV scribe Carlton Cuse, character is the crucial core of story. Cuse’s sly thriller series Bates Motel draws its dark irony from the inner weirdness of Norma and Norman Bates (Vera Farmiga and Freddie Highmore), the ultimate, emotionally incestuous mother-son duo. And yes, it’s that Norman Bates and his memorable mommy-dearest. Bates Motel is indeed a shrewd prequel to Alfred Hitchcock’s infamous 1960 film Psycho, in which seemingly sweet Norman (Anthony Perkins) lives with his mummified mother and stabs a hapless young blonde (Janet Leigh) in the movie’s iconic shower scene. But Bates is more than a bunch of recycled Psycho-babble. Returing in March for its shivery third season, the series digs deep into Norma’s and Norman’s troubled past, sketching Norman’s teenage years and his struggle to save his damaged soul. As envisioned by Cuse and fellow series creator/executive producer/writer Kerry Ehrin, the Norman-Norma show is a neat tap dance of love and toxic smothering that makes Bates especially binge-watch-worthy. The Adventures of Brisco County Jr., starring cult actor Bruce Campbell. A decade later, Cuse fashioned flamboyant cops-’n’-perps for his high-action crime caper Nash Bridges. Then came Lost, that maddeningly mystifying plane-crash-survivors saga, for which Cuse honed a bevy of bizarre personalities. Now the prolific writer and showrunner is readying a new round of Bates Motel and polishing a menacing scifi thriller, The Returned, set to premiere on A&E in 2015. With all this on his plate, Cuse still took time recently to talk Norma and Norman, story strategy and lessons learned from years of penning primetime TV. What’s the allure of extending the mythology of an uber-iconic film like Psycho with Bates Motel? The allure for both myself and Kerry Ehrin was to take this iconic character of Norman Bates and re-imagine the character of his mother and tell a wonderful sort of love story in a tragedy. If you go to a network and you say, “Hey, I’m going to pitch you a great tragedy that takes the form of a love story between a mother and a son,” no one’s going to buy that. It needs to be wrapped in some sort of saleable clothes. The clothing in this case is the moniker of the Psycho franchise. It’s that thing that allows the audience some point of connection to understand who these characters are. But the allure is really being able to write a story about a boy who has got some flaws in his DNA and is going to grow up to be a terrible guy. And his mother who loves him more than anything in the world and is trying to stop him from becoming that guy, and due to her own issues, ends up in some way catalyzing the process. That seems like a really good story to me. Kerry and I latched on to that as the central dynamic of what makes the show tick. You have that at the core, and then you can tell a story about their lives within this really crazy, bent Oregon coastal town, and that would make for a cool show. And fortunately it seems like a lot of people like it. Bates Motel obviously has a larger cast than the film Psycho. How did you choose the additional characters you created for the TV series? Deciding to make Bates a contemporary prequel freed us from the mythology of the film and allowed us free rein to come up with whatever characters we wanted to come up with. We decided that there’s no point in remaking Psycho, there’s no point in coming up with a bad, literal lead-up to Psycho. What was interesting was taking these two characters, Norman and his mother Norma, and setting them in a unique world that was of our own creation. We wanted to put our characters in a town that seemed bucolic on the surface but had a really dark underbelly to it, and to write really pulpy, somewhat larger than life crime stories, and then juxtapose those with really nuanced character scenes between Norman and Norma. 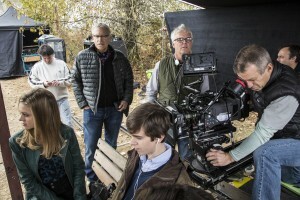 Cuse with the actors and crew on the set of Bates Motel. And really everything else in the show is invented. We don’t have any other characters that overlap from the movie. Right from the very get-go, one of the first things I had wanted to do was to add in the character of a brother for Norman [Dylan, played by Max Thieriot]. It was a great opportunity to have a window on Norma’s and Norman’s relationship through this third party who was another family member. By definition, he would be on the outside of the Norma-Norman relationship. And that triangle relationship would create a lot of intrigue and tension. So Kerry and I wrote the pilot with the brother character being an important part of the story, but he doesn’t exist in the Psycho lore. By adding the brother character it immediately tells you, this is not Psycho, this is not a literal version of Psycho. I think it’s taken some of the audience a while to get it, to catch on to what we’re doing, to understand that it’s not a literal remake of the movie and that you have to really embrace the show on its own terms. And I think that after two seasons, we’re at a point now where the audience is doing that. And that’s really exciting. After 20 episodes, people have a better understanding of what we’re trying to accomplish. And how do you juggle Norma and Norman to make sure one doesn’t overshadow the other? We think of Norma and Norman as the double helix of DNA that is at the center of the show. Every story needs in some way to be built around those two characters. We don’t think of them as individual entities. We think about their relationship with each other as the central relationship that is either driving story or is affected by story. So what’s more important, story or character? Audiences are not watching most shows for plot. What they might call plot is actually a compelling desire to see what a character will do when he or she is put in a bad situation. That situation could be physical, it could be emotional, it could be self-imposed or exposed by some force of antagonism. But it’s wanting to see how the characters are going to react to unfortunate circumstances. 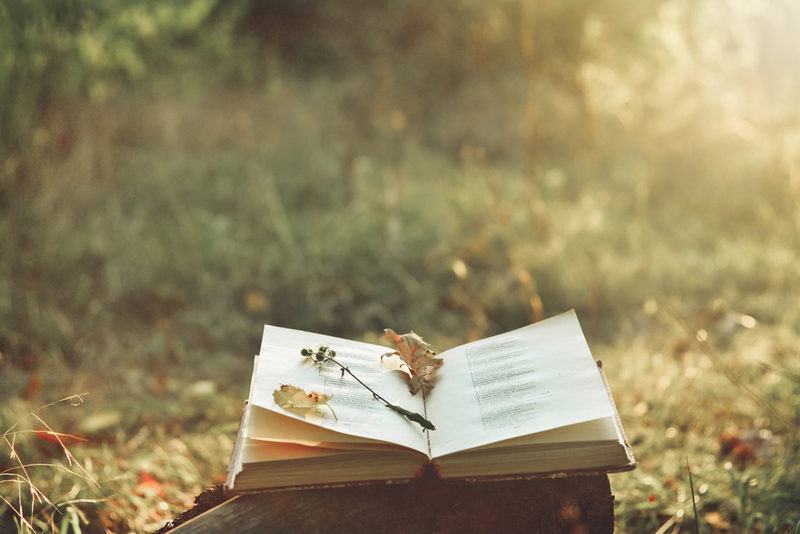 Stories are the ways in which we learn the most important lessons of our lives. If you can get an audience to become really attached to a character, they hopefully will become really compelled by that character’s journey. Bates Motel’s credits include a nod to Robert Bloch’s book, Psycho, on which Hitchcock’s film was based. Is Bates in any way based on the novel, which differs quite a bit from the film? It’s not a credit that I determine, or that Universal Studios [the studio that produces Bates Motel] or A&E determines. It’s a credit that’s determined by the Writers Guild of America. The WGA determines writing credits on all movies and TV shows and part of that process is acknowledging the source material upon which your creation is based. In this case, they didn’t feel it was enough to acknowledge that it was based on the film Psycho. They wanted to carry that acknowledgment deeper and have it include the underlying book that the movie was based on. You write scripts and work out ideas with Kerry Ehrin. 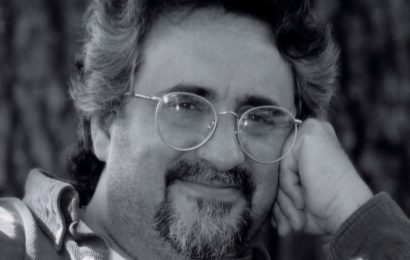 Why have a writing partner? I would dissuade anyone from believing in the myth that creativity is always a singular process or that it’s best as a singular process. TV writing is really at its best when it’s a functioning, collaborative process. Kerry and I have a wonderfully collaborative creative process. I think our brains are a little bit different. We bring different things to the table. If you think about combining Lost with Friday Night Lights [the NBC series on which Ehrin was a writer and producer], there are two different qualities to those shows. But in this case, like chocolate and peanut butter, they go together really well. There are two levels of collaboration. There’s my collaboration with Kerry and then there’s our collaboration jointly with the writers’ room. That’s where the ideas stem from. There are seven people in there including us. And the purpose of the writers’ room is to be the story engine for the show. And really there’s not necessarily a set order to how things happen. Kerry and I will toss around ideas privately between each other. Sometimes ideas will come up in the writers’ room. A lot of this is really intuitive. Kerry and I are making the show that we ourselves would want to watch, and that’s what drives the process. We just try to come up with a story that’s like, “Oh, that’s cool. I like that.” It’s kind of a gut thing. It’s not a heavily intellectual process, and it’s certainly not one that’s driven by some sort of external rules that we’ve imposed upon ourselves. There’s a wonderfully funny scene in the season one episode “Underwater” in which Norma, who clearly has her own weird psychopathology, whines, “Why do crazy people keep gravitating toward me?” Why is humor important to a foreboding drama like Bates Motel? 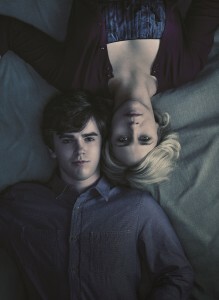 Vera Farmiga’s Norma Bates and Freddie Highmore’s Norman get (a little too) cozy in Carlton Cuse’s TV series Bates Motel. That particular line was written by Kerry, and it’s one of my favorites. It’s very conscious on our part to make the show humorous. That differentiates our show from other shows that have a “serial killer” label, which is kind of incomplete when it comes to describing Bates Motel. The difference is the humor, and we really work on it. Vera and Freddie are very funny. They’re wonderfully charming people. If you have actors that are funny and charming and you’re not writing them being funny and charming, you’re making a horrible mistake. So we are taking advantage of the prodigious talents of our performers. And also in general, Kerry and I have a very fond, funny relationship, and the way we like to joke around with each other ends up getting reflected in the way we write the show. Why did you reveal at the very end of season two that Norman passed his polygraph test, even though he said he didn’t kill his high school teacher, Miss Watson? Why did you decide not to end the season with a cliffhanger that would keep viewers guessing? Kerry and I co-wrote that episode. For us, the decision was that to end it on a cliffhanger would be really frustrating for the audience. I think I learned my lesson about cliffhangers after the first season of Lost when I wrote a final episode of the first season with Damon Lindelof in which we ended with our characters peering down into a hatch. People were very angry about having to wait many months to find out what was in the hatch. The emotional end point of the second season of Bates Motel wasn’t the mystery of whether Norman was guilty or not. The end of the season was the revelation that Norman was in a mental place where he was able to have an image of his mother convince him of his innocence. That distortion of truth in his brain represents a significant step on his journey to become the guy that we know from the movie Psycho. It felt like taking that leap was what was going to make for a really great season-ender. How far in advance do you plan out the plot for Bates Motel? We have a general architecture of how we see the series playing out over the next three seasons. I would say that we know in a general way. The analogy I like to make is that it’s like taking a road trip. We’re driving from here to New York, and we’re going to stop in Denver and we’re going to stop in Chicago and Kansas City. But every day we get up and decide whether we’re going to take the rural back road or the interstate. So we leave ourselves a lot of room for discovery and for side trips and for the process of exploration that’s part of any journey. We do have certain landmarks, and we know we want to try to get to these landmarks at certain times. But nothing is super-fixed in stone. A TV show is very organic, and you need to allow yourself a lot of room to listen to the show, learn from it and discover creatively what the best path is as you’re writing a show. As showrunners, how much rewriting of other writers’ scripts do you and Kerry do? It’s our job as showrunners to take those ideas and shape and craft and oversee the process of the ideas. And then turn them into a story on white boards or on cards, and then into an outline, and then into a script. And then have them go through revision. It’s a pretty rigorous process. We probably spend three or four days in the writers’ room, coming up with the general idea for the story, and then another three or four days putting it into some sort of form on the board. Then that is turned into an outline by a writer. We give notes on the outline [and] that outline is often rewritten. Then the outline is turned into a script. We give the writer notes on a script, and then often a second round of notes, and then after that we may do some rewriting on the script ourselves to get it to a place where we feel it needs to be. And then on top of that, once the script starts prepping and goes into production there’s usually a bunch of rewriting that’s done to accommodate the shooting schedule, locations. The physical aspects of production sometimes require changes. So there are many, many passes on a script, and it’s never really finished until it’s shot. As both writer and executive producer, is there a specific atmosphere you prefer in your writers’ room? You don’t want people to feel intimidated in the writers’ room. You need to create an environment where no one gets criticized for a bad idea, where no one is judged for his or her pitches. The worst possible thing is to have people censor their ideas. Certainly on Lost, some of the craziest ideas ended up being some of the best parts of the show. And on Bates, there’s a lot of crazy-wild stuff, and you really want to encourage people to throw out to you, “What if?” Even if it’s nuts, it might lead to someone thinking of something a little less nuts that’s also super-cool. A good lunch is also important. Good take-out food. You’re obviously a seasoned writer now. What have you learned the hard way about scriptwriting? Everything I do now is based on the experiences I’ve had over the course of my career. I was fortunate to get some writing jobs at a point where I don’t think I was as good a writer as I am now. But fortunately I was good enough to get those jobs and get some on-the-job training. What have you learned over time about crafting character? It sounds very simplistic and obvious, but it’s really the idea of letting the characters drive the action in the story. My instincts initially as a writer were to willfully impose plot upon characters. I think over time I’ve become better at trying to focus on understanding the character and inhabiting the character, and letting the character decide, and really thinking about “what would the character do?” and “what does the character want?” And then following the actions of the character, and in the actions of the character, particularly character in conflict, we discover the stuff that makes that character tick. Hopefully through conflict, you’re revealing the true nature of your character and you’re providing your audience with insights about that character. In the early part of my career, I was more focused on thinking that you could succeed with great narrative. But narrative is highly overrated. For me, the journey of my own writing career has been to increasingly see that character is what matters in writing and that it is the most important thing to attend to. Have you developed any personal writing rituals? I’m kind of an anti-writing ritual guy. To be successful as a professional writer, you need to be able to do your craft anywhere, anytime. You don’t need to get all your preconditions right. Some writers feel like they have to have everything in alignment. They think, “I need five hours time, and I need to be sitting in a beautiful remote place where there’s no distraction, and I need to have had a good meal, and I need to have exercised and to have taken care of all my to-do list items.” Those are all incredibly wonderful methods of procrastination. If you’re a good writer, you need to be able to write anywhere, anytime. I remember once riding on a plane with David Mamet [the playwright/screenwriter] who was furiously scribbling away as passengers were loading onto the plane. People were peering down, trying to see what he was actually writing. I think that’s great. I respect that. Especially when you’re busy trying to do a TV show, which is a huge workload, you need to be able to write any place, any time. Not treating the actual process preciously removes some of the inhibitions that people put in their path. Those inhibitions become excuses to not write. J.K. Rowling [author of the Harry Potter novels] talks a lot about the life she had and the difficult conditions under which she wrote one of the greatest series of novels, certainly maybe the most successful series of novels, of our time. So circumstances, getting everything right, having everything perfect, are vastly over-rated for success as a writer. What qualities do you look for when you’re hiring a Bates Motel writer? It’s a little bit like putting an orchestra together. You look for different voices that will work in harmony with each other. Each writer flavors the show in a different way and has certain strengths. As a showrunner, your job is to maximize those resources. So different writers get hired for different reasons. This year, the writers’ room has a guy who started as a horror writer. There’s a young writer who’s been a semi-finalist twice in the Nicholl Screenwriting Competition. We have a married couple. He was a writer on Boardwalk Empire. We have a young female writer who was on Suits. We have this real diverse cast of characters. And my hope is that each person in the room is going to bring a different perspective, a different point of view, a different personal history, and then we can pull from all their different backgrounds and skill sets as writers to make something that is greater than the sum of its parts. It’s just two-fold. Read Stephen King’s book on writing [On Writing: A Memoir of the Craft], which is the best book out there on writing, and write. 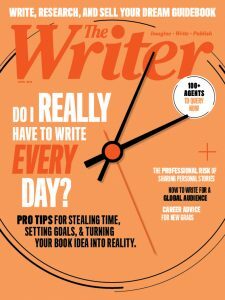 I believe in the Malcolm Gladwell 10,000-hour rule, that you have to do a lot of writing before you really find your voice, before you have a mastery of your craft. Being a writer is a really hard existence. Particularly the Hollywood writing world is a very competitive world. You have to have such a passion for it. I would and will continue to write until long after people probably won’t want to pay me to do it anymore. It’s absolutely a compulsion for me. You need to have that. You need to feel like there’s almost nothing else you’d rather do. And you just have to keep writing and writing and writing and not think, OK, I’m going to write the one great American screenplay or the one great American TV pilot. I remember I was doing a panel [The Hollywood Reporter’s Drama Showrunner Roundtable] with Aaron Sorkin [creator/writer of the TV series The West Wing and screenwriter of the film The Social Network]. He absolutely believes that the best thing he’s ever written has not even been written. He believes that his best script is still somewhere inside him. That’s a fantastic comment because you always have to feel like you’re getting better at what you’re doing and that your best script is still yet to come. And along that rising arc of your career, hopefully someone will recognize your talent and hire you and pay you for the work that’s part of that journey. But the journey is still the same. It’s about constantly working in small ways and big ways to make yourself better at what you do. 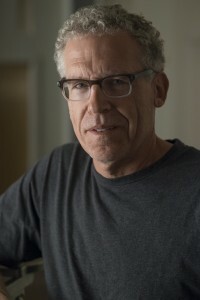 Carlton Cuse is a creator/writer/executive producer of the A&E drama series Bates Motel. He is also an executive producer of the upcoming A&E drama series The Returned. 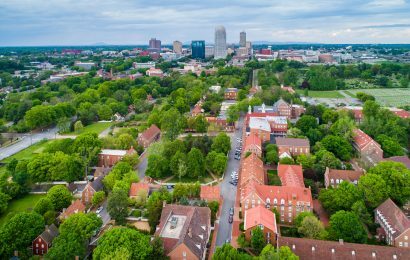 Cuse was born in Mexico City and grew up in Boston and Orange County, Calif. He graduated from Harvard University with a degree in American history. Won Producers Guild Award, Outstanding Producer of Episodic Television, Lost, 2006. Nominated, British Academy of Film and Television Arts (BAFTA) TV Award, Best International, Lost, 2007. Writer Crime Story (TV series, NBC), 1986. Kinney Littlefield is a New York-based entertainment journalist who has covered TV for The Associated Press. She is a former staff TV critic for The Orange County Register in Southern California. Like writing crime stories? Click here to enter our Crime Pays contest. The deadline to enter is July 31.